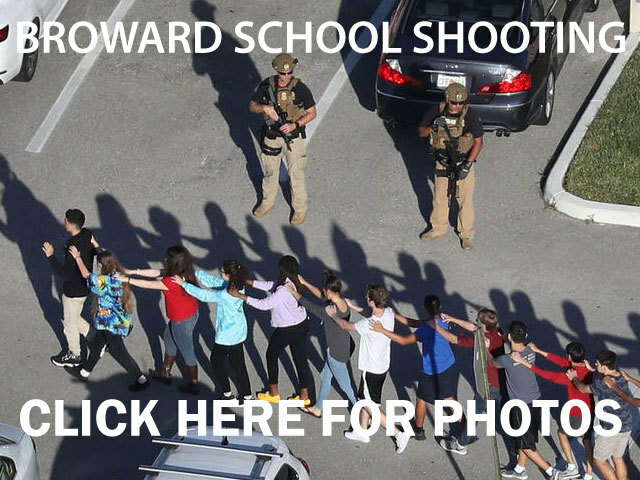 PARKLAND, Fla. (AP)-- A Florida judge has ordered that the suspect in a deadly shooting rampage at a high school will be held without bond on 17 counts of murder. Nikolas Cruz was wearing an orange jumpsuit with his hands cuffed at his waist during the Thursday afternoon hearing. His attorney did not contest the order and had her arm around Cruz during the brief court appearance. Earlier Thursday, television footage showed Nikolas Jacob Cruz being escorted by sheriff's deputies from the Broward Sheriff's headquarters to the county jail in Fort Lauderdale. His mugshot was released a short time later. Cruz was booked into the Broward County Jail early Thursday, still wearing the hospital gown he was given after being treated for labored breathing following his arrest. He was later questioned overnight before being booked into jail. Cruz is listed at 5-foot-7 and 131-pounds. Seventeen people were killed as gunfire erupted at Marjorie Stoneman Douglas High School just before classes ended Wednesday afternoon. Cruz was captured in a quiet neighborhood about two miles from the school. Sheriff's officials said in an email that Cruz was initially taken to a hospital for labored breathing before being questioned at sheriff's headquarters. Counselors are being made available for students, teachers and staff , but the school will remain closed as an investigation continues. Cruz, equipped with a gas mask, smoke grenades and multiple magazines of ammunition, opened fire with a semi-automatic weapon, killing 17 people and sending hundreds of students fleeing into the streets. It was the nation's deadliest school shooting since a gunman attacked an elementary school in Newtown, Connecticut, more than five years ago.